I'm always on the go and I pretty much carry my life around with me, so I can honestly really appreciate a bag that can fit everything I need. I can't tell you how long I've been looking for a cute lightweight enough bag that will fit what I need without feeling like my shoulder is about to fall off within the hour. 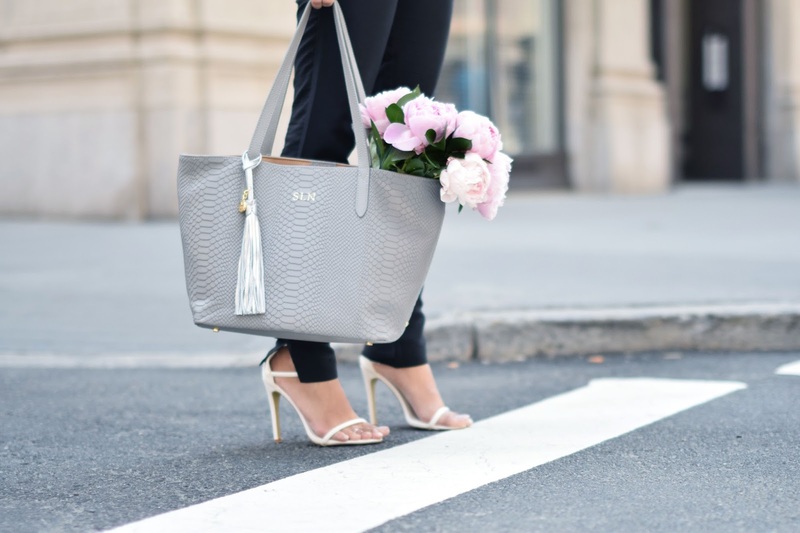 GiGi New York seriously outdid themselves with this Teddie tote. It's 13.5" wide x 11" tall x 6" deep, with a zipper compartment in the center. It's super roomy, and I can fit my Macbook Pro in there, along with my wallet, keys, cellphone, both cellphone and laptop chargers, sunglasses, and a pair of shoes when I travel. Also, can we talk about this super cute, goes-with-everything embossed python print? GiGi has the Teddie tote in a bunch of different colors, but my favorite for the summer was this slate color. It's a neutral shade, and light enough shade to wear every day. I've gone on a ton of mini trips the past month, and this is the one bag I always think of bringing. For my next trip this month, I'll be carrying my GiGi Teddie tote on the plane along with my trusty passport case and bag tassel. For those who are a bit more petite, or want a smaller bag, GiGi makes a smaller version called the Taylor bag (with zip here)!